Do you follow more than 100 people on Twitter? If so, have you ever tried to manage them on Twitter .com? It’s awful. Really awful. They make you go through page after page of names in no real order (other than how recently you added them). If you want to remove some people you followed years ago, it’s a huge pain. Seesmic has just made a much better way. 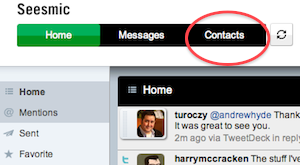 The new Seesmic Web app, launching today, brings with it a new main tab: Contacts. As you can guess, this is a contact manager for Twitter that makes pruning your Twitter contacts a breeze. It also gives you plenty of other interesting information about your followers, those who follow you, and all your Twitter Lists, on the fly. For example, for each person you can not only see all their Twitter profile information, but also their Twitter stats from MrTweet which tell you how often they tweet and who they contact the most (publicly) on Twitter. And all of this is wrapped up in a way that looks very similar to Google’s contact manager that is built into Gmail, so it should be familiar to many of you. But it’s actually better because they show Twitter icons next to each users name, which is an easy way to sort through people. Another new contact management feature Seesmic Web has added is the ability to drag and drop any user to add them to a list. Again, this is about 1,000 times easier than doing it on Twitter.com. As you might imagine, Seesmic Web also now has the ability to make, delete and alter Twitter Lists. Other new features include better conversation threading (if you click on the “in reply to” portion below a tweet, you’ll see an overlay with the entire back-and-forth). Also new is Tweetmeme retweet data for each link in a tweet. Simply click on the “+” button next to a link to see an overlay with that data (including a text snippet and image). The ability to upload pictures directly from the app, and tag tweets with your geolocation (assuming you’re using something like Google Gears that can add that to the browser) has also been added. Other, smaller UI tweaks have been made as well. With the addition of Retweets and Lists over the past few months, Twitter.com has become a very useful client itself once again. But other web-based Twitter clients like Brizzly and Seesmic Web clearly believe they can still do a better job than Twitter itself. And with this contact management system, Seesmic Web just gave me a definite excuse to start using it.